This canvas is one of the most famous paintings of the Restoration in Piedmont, already in 1829 was presented in the Turin Exposition.In the center is the mother Raffaella with two daughters, a granddaughter and twelve of his sixteen children, among them there are the four generals who contributed to the unification of Italy and who where preminent members of the aristocracy of that time. Absent the father Celestine, who died in 1805.This painting assumes a special simbolical meaning on the occasion of 150anniversary of the Unification of Italy years 2011-2012.In fact it was lent by the family Alberti La Marmora for the two previous anniversaries of the Unification of Italy: in the 50th anniversary, 1911, the painting was part of the exhibition on the Italian portrait held in Florence. In 1961, one hundred years later the unification, the painting was exhibited in Palazzo Carignano in Torino. - In 2011 at Miradolo Castle (Torino) in the exhibition "The forgotten heroes. Women in Piedmont Risorgimento "(Miradolo Castle, April 2 to 26 June 2011). 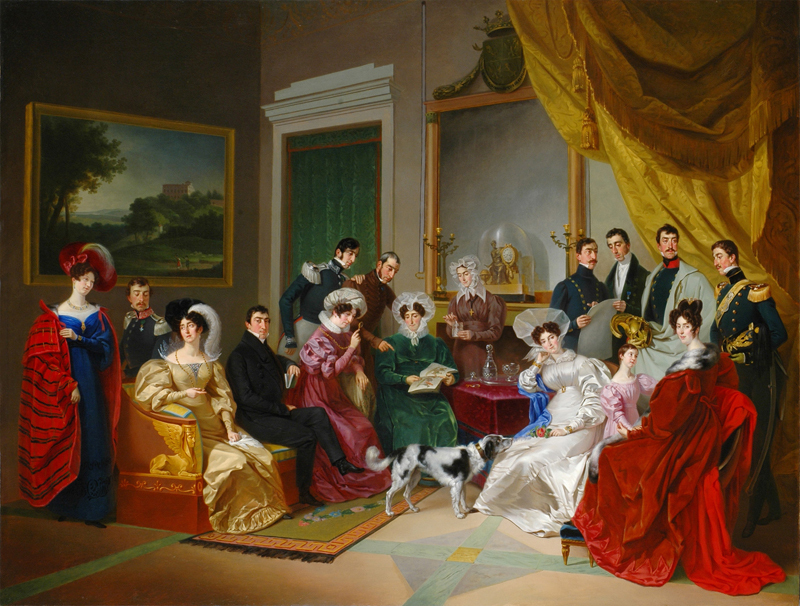 The painting celebrates the roles and functions of La Marmora in 1828 as part of the administrative and social tissue of Savoy. It depicts elements that still echoes the Napoleonic era together with those ones that are already pointing towards the Risorgimento. The four brothers La Marmora, Carlo Emanuele, Alberto, Alessandro and Alfonso, had an important role in the history of the Italian army and their name is bound to four military corps still in existence today: the Cuirassiers to Charles Emmanuel, the Grenadiers of Sardinia to Albert, the Bersaglieri to Alessandro and the cavallery to Alfonso. The painting since 2007 has been entrusted by the family Alberti La Marmara to the no-profit organization Centro Studi Generazioni e Luoghi and is kept in Biella at Palazzo La Marmora. A film that gives an analysis of the paintings and that tells the stories behind those who are portraided there is available at our You Tube Channel Archivilamarmora.